This best-selling and thoroughly revised reference shares the best practices, victories, essential steps for success, and yes, the mistakes, which Joel Levitt has gleaned from working with countless organizations over a 30-year period. It is the first book to address all four elements essential for success in preventive maintenance systems - engineering, economic, psychological (people), and management - thereby enabling all who use it to have a balanced understanding of what is happening their organizations. Blending concrete actionable steps and structures with the underlying theory, the author has included check sheets, sample task lists, protocols for analysis, as well as stories and case histories. This complete guide will be a practical and invaluable on-the-job resource for maintenance managers, engineers, planners, supervisors, PM group leaders and PM mechanics. • Includes added chapters on PM for shutdowns. • Contains material on how to understand and avoid iatrogenic failure (failures caused by servicing). • Features a greatly expanded discussion of the concept of the P/F curve and how to make it a more useful tool. 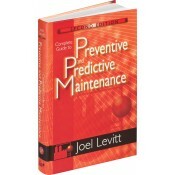 • Provides information on how to explain and sell Proactive Maintenance to management. • Includes check sheets, history of PM, stories, photographs, and case histories. • Contains a glossary of terms. • Provides sample task lists for a variety of equipment with some of the logic behind each task. • Offers templates for developing your own tasking. • Includes protocols for detailed economic analysis with examples.